Scientists in the U.S. say human trials of gene therapy for an inherited form of blindness known as vitelliform macular degeneration, or Best disease, could be less than two years away, following successful use of the treatment in a canine model of the disease. Developed through a longstanding collaboration between scientists at the University of Pennsylvania’s School of Veterinary Medicine and Penn’s Perelman School of Medicine, the canine therapy, which involves injections of a healthy copy of the causative BEST1 gene, corrected both mild and more severe lesions in animals with early- and mid-stage disease. Best disease is caused by mutations in a gene called BEST1, and often manifests in children and young adults. “In humans, BEST1 mutations result in a wide spectrum of IRDs [inherited retinal degenerations] collectively grouped as bestrophinopathies that often involve pathognomonic macular lesions,” the authors explain. In fact, dominant or recessive bestrophinopathies that are associated with mutations in the BEST1 gene represent the most common forms of monogenic macular degeneration worldwide. The BEST1 gene encodes a transmembrane protein associated with part of the retinal pigment epithelium (RPE). Mutations in BEST1 cause detachment of the retina and degeneration of photoreceptor (PR) cells. The Penn team had previously shown that dogs can develop a very similar disorder to human Best disease. A study by co-researcher William Beltran, Ph.D., professor of ophthalmology at Penn Vet’s Division of Experimental Retinal Therapies, showed that dogs, like humans have a fovea at the center of their retina, and that BEST1 mutations in both humans and dogs compromise the fovea, leading to loss of vision. When the researchers used a noninvasive imaging technique known as optical coherence tomography (OCT) to examine the eyes of young dogs with Best disease, but before lesions were detectable using an ophthalmoscope, they found that the RPE-PR separation worsened dramatically under light. When the animals' eyes were exposed to bright lights, they separation increased, whereas it decreased in eyes exposed to lower light levels. “We show that retinal light exposure expands, and dark adaptation contracts, the microdetachments,” the authors write. While it is not known whether light makes RPE-PR separation more pronounced in human Best disease, the researchers were still able to demonstrate that separation between RPE and photoreceptors affects vision in patients. They measured the time it took for patients to adjust their vision when they were placed in the dark, correlated this with the time it takes for nutrients to diffuse between the RPE and PR cell layers, which is integral to dark adaptation, or acquiring night vision. Their results indicated that a longer distance was associated with much slower rates of nutrient transport. The team developed an adeno-associated viral (AAV) vector-based gene therapy construct carrying a healthy copy of either the canine or human BEST1 gene and injected it into either one or both eyes of dogs with early- or mid-stage canine Best disease. 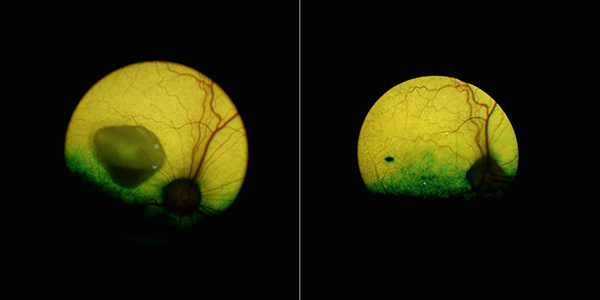 Injections were made directly into retinal areas with macro- and microdetachments. Analysis of the treated animals confirmed that the gene therapy had restored the “zipper”-like connection between the RPE and PR cells. When the eyes of treated dogs were exposed to light, cell separation didn’t occur in areas of the retinas that had been treated. Disease reversal was first apparent in the injected eye at four weeks postinjection, and encouragingly, treated dogs’ eyes remained free of disease for up to five years. The gene therapy was effective in dogs whether they were treated using the human or the canine BEST gene. “At the molecular level, we confirmed that both the canine as well as the human BEST1 transgene can correct the apposition of the RPE–PR complex and restore the cytoarchitecture of this critical interface,” the rearchers write. Although continued work will be needed to evaluate safety, identify human patients who may benefit, and determine whether the treatment may be suitable for patients with more advanced disease, the researchers hope that clinical gene therapy trials could start within a few years.